The bone skull mask is colored as pictured. Mask is one size fits most with an elastic tie. Quickly and easily create a fanged skeleton look for Halloween, haunted houses, and any other masquerade where you want to provide a scare. The mask has a yellowish tint to it. For added horror effects add some blood to the teeth. 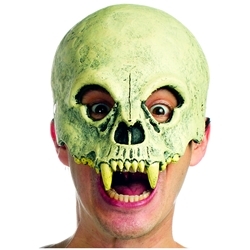 This mask can be paired up with almost any costume to give it a horror twist.